In looking at my work so far, I noticed that the area of the Pennamaquan trestle didn’t quite give me the perspective I needed. It was too high above the water surface. The prototype sits in fairly deep water and much of the piling structure is submerged. The solution was to raise the water level on the model. 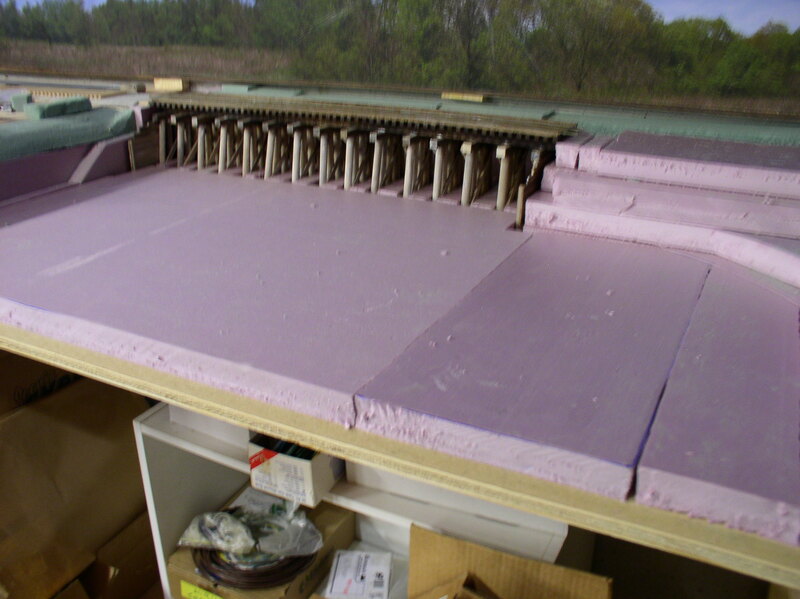 The first step is shown here using foam board. The second step will be to add a plaster covering to seal the riverbed along with shaping of the banks. 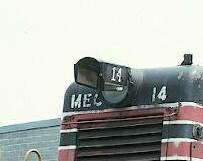 In a response to the last blog entry I mentioned the shroud or visor over the headlight which is a distinctive feature of the MEC 44 T. This is what I am talking about below. After making a couple of samples, it seems that cutting and bending thin brass will work the best. The next time I’m back in the shop I’ll have to try a pair on No. 15. There is little progress to report on the railroad. Travel and chores have taken their toll. 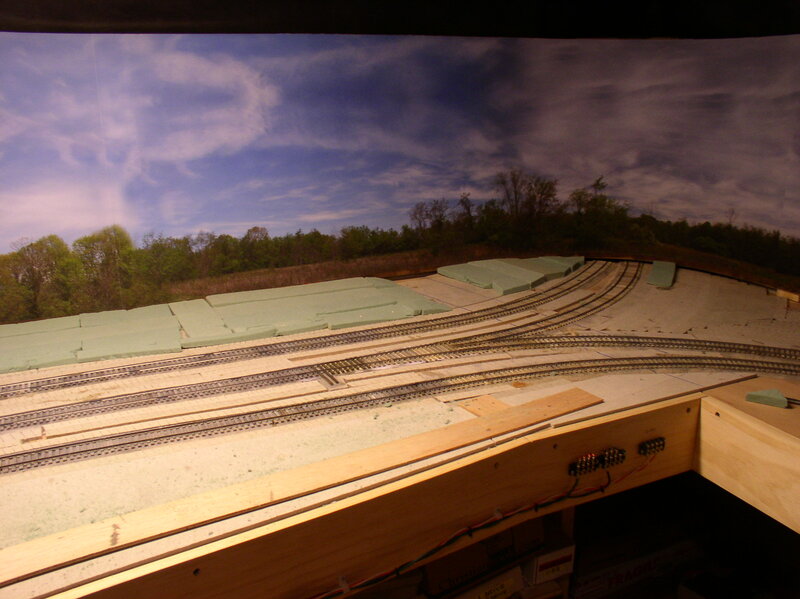 I have been able to do a few things in the model shop which is located at home. I was able to rescue another Yoder 44 T from a friend. It came as a basic black factory paint job. I have now lettered it for MEC 15. 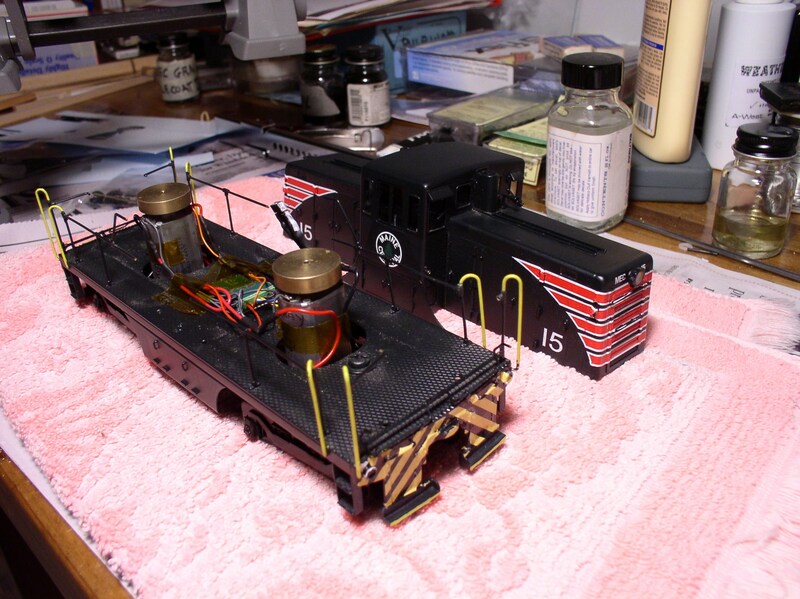 Weathering will be next and then a test of the TCS decoder. It came with that particular decoder that I have no experience with, so I will need to comparatively test it against my other locomotives that have NCE decoders. With the addition of 15 to the roster, the total is now three, one other Yoder and an Acme that was built from a brass kit. 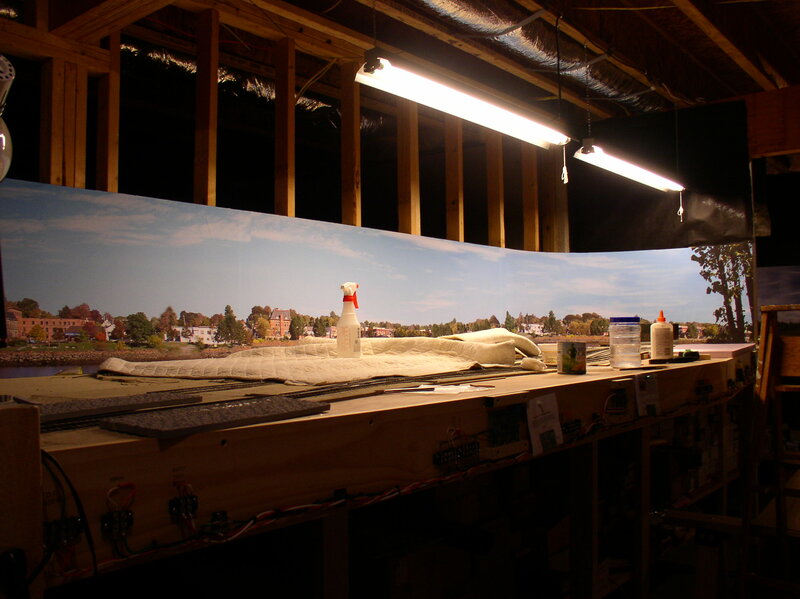 Now that the bench work has reached Eastport, the opportunity to mount the photo backdrop in Calais came about. 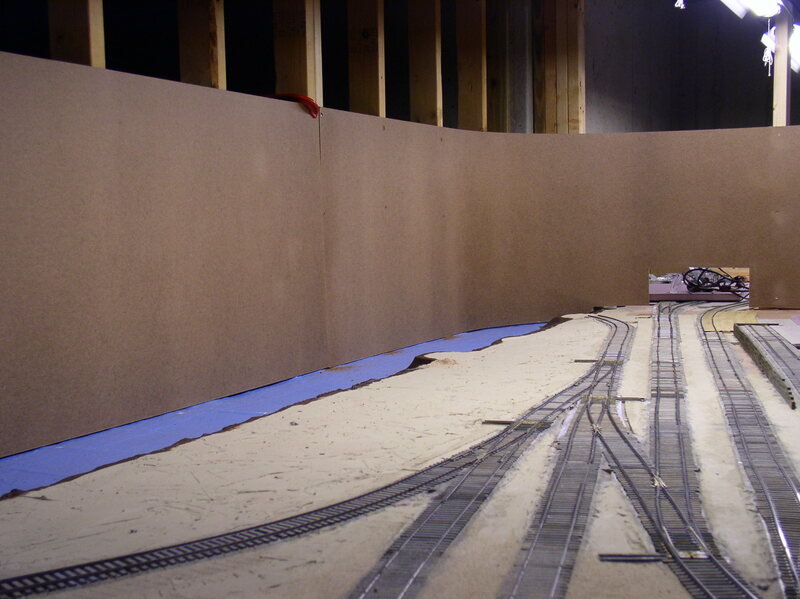 I had previously prepared the Masonite backing panels for this area as shown below. Because of several reasons this area of the backdrop had to be mounted unrolling it from right to left. The previous backdrops were mounted going from left to right, which is the more normal way to do it, if there is such a thing as ‘normal’. After I got my hands figured out it went pretty smoothly. Note that the studwork above the backdrop still must be covered. I am using a black landscaping cloth which is some kind of non woven fiber mat which has a dead flat finish. I really like the effect of blacking out everything that would distract from the modeled scene itself. The backdrop itself is only two feet high, but because of the height of the bench work, it yields a very good perspective when one stands in front of it. 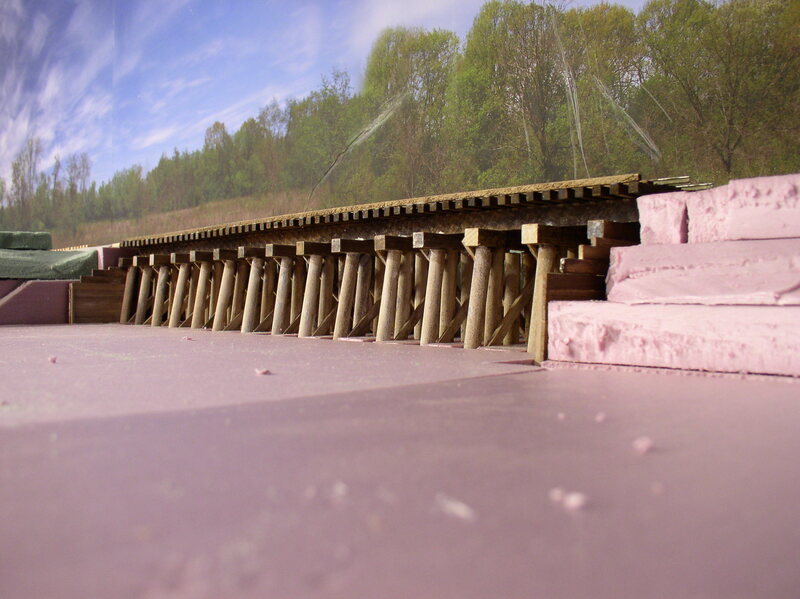 The idea is to be conscious of the backdrop while concentrating on the modeled portion of the railroad. So far I feel I have achieved this, although it is difficult to capture this feeling with the camera. During November I have also started placing florist foam in Ayers Junction in order to build up some of the landscape. This is my first time using this material and I am enjoying experimenting with it. The material is quite soft and easy to damage so it must be handled carefully. There are several varieties and I have settled on the dry foam. I have also found that prices for this stuff are all over the map, so it pays to shop around. As you note, I am just cutting small slices and blocks and gluing them in place. I will use a Stanley Surform plane to shape it along with holding a vacuum nozzle at the same time. The foam is quite weak in structure and carves into a gritty powder that gets everywhere unless controlled by the vacuum almost immediately.. Once the shape is final, I will cover the foam with plaster cloth to get a thin yet hard surface. The availability of plaster casting cloth that needs only to be unrolled and wetted has made modeling ground surface so much easier and far less messy.